Nissan will be bringing three concepts to the 2018 Tokyo Auto Salon that will happen next month. They are the Leaf, X-Trail and NV350 Grand Touring Concepts, and they’re lightly modded examples of the electric hatchback, SUV and van, respectively. Let’s start with the Leaf Grand Touring. 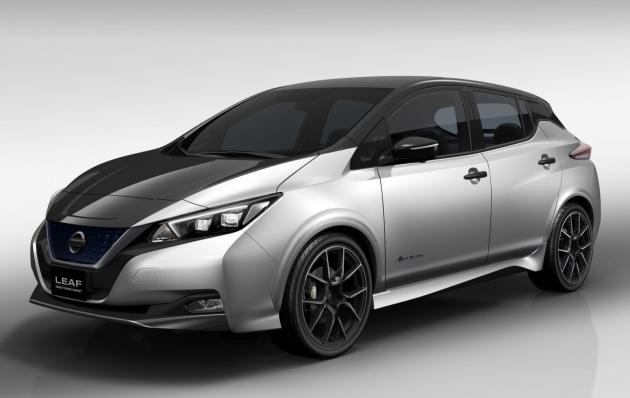 It’s not as overtly sporty as the Leaf Nismo Concept, and lacks the Nismo proposal’s unique bumper and red accents, but the GT looks significantly bolder and sportier than the stock EV. It gets a black bonnet to match the already-there black roof and bumper, and the net result is continuous black flowing through the middle. The upsized wheels nicely round up the minor spruce-up. This looks simple enough (but effective) to be a proper trim level for the second-generation Leaf – a Grand Touring pack. The X-Trail Grand Touring sees Nissan kit up the recently facelifted SUV to look more rugged. The macho off-road look sees the chrome on the Nissan emblem and V-motion grille blacked out, same goes to the silver on the lower bumper guard and roof rails. The designers have also added rough-textured black trim on the lower portion of the front and sides, replacing the smooth plastic. The overfenders get small tabs on the top and the SUV gets large spider-spoke wheels. Decals too, of course. Possibly cool, but this image change doesn’t match the “Grand Touring” name, does it? The NV350 Caravan (Urvan here) also goes for the off-road look, and sits on BF Goodrich all-terrain rubber. Like the Leaf, the centre spine of the van is all in black, but the NV350’s face is completely dark. Fancy lights and decals complete the makeover. Even basic Leaf also cannot sell in Malaysia. Gomen say buy EV but they sell EV car at RM200k.